Set 72kms off the coast of Queensland, Australia, Heron Island Resort boasts accommodation in a stunning location: a natural coral cay surrounded by 24 hectares of coral reef at the southern end of the Great Barrier Reef.  Heron Island is famous around the world for its’ spectacular coral reef, extraordinary variety of aquatic life, nesting turtles, migrating whales and as a breeding sanctuary for an abundance of bird life. At Heron Island you are very much a guest of the natural environment. Here, you can snorkel straight off the beach into the crystal-clear aquamarine waters all year round. Heron Island is also a PADI 5-star dive destination with 20 sites easily accessible by boat within minutes of the jetty. Getting to Heron Island Resort and the Great Barrier Reef takes just a little bit of planning, but it’s well worth the effort. The nearest urban centre and commercial airport is located 72kms from Heron Island in Gladstone. Regular flights to Gladstone are available via Brisbane with either Qantas or Virgin Australia. For an online map of Gladstone click here. Our remote and unique location makes for the perfect holiday destination, HOWEVER, it’s important to note that travelling to paradise comes with risks that are out of our control, and yours. For this reason, we highly recommend that all of our guests purchase travel insurance prior to travelling. Please take the time to review your travel insurance policy to ensure that you are covered in the unlikely event that your travel plans are disrupted due to weather or acts of god. 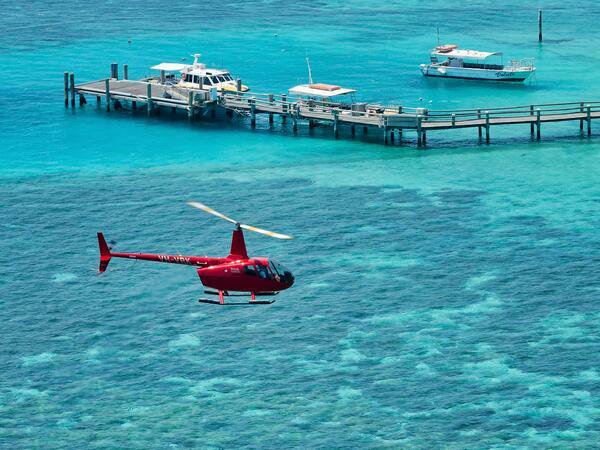 Once in Gladstone, you have a choice of three transfer options to get to Heron Island itself. At 34 metres, The Heron Islander is specifically designed to provide a comfortable and spacious transfer from the Queensland mainland to Heron Island. She comfortably seats 170 and has a top speed of 30 knots (55 km/h). With the exception of Tuesdays and Thursdays, the Heron Islander makes one return trip per day between Heron Island and Gladstone, per the schedules below. We recommend a flight arrival into Gladstone no later than 1½ hours prior to our sailing times. Please note, Aldesta Hotels does not accept responsibility for flight delays or flight schedule changes. Guests arriving by air can book an Airport-to-Marina bus transfer at the time of making their reservation. The bus transfer departs 8:30 am in front of the Airport Arrivals area. If you’re making your own way to the Gladstone Marina, you’ll find it at Bryan Jordan Drive, Gladstone. Check-in at the marina opens at 8:30 am. We strongly recommend you pre-book secure car lock-up facilities by calling Compleat Angler on 07 4972 7283, available for $12 AUD per day for a covered car park, or $10 AUD per day for an uncovered spot. Should you have any questions pertaining to your transfer to Heron Island, please call the Heron Island Marina Office on (07) 4972 5166. It is recommended that domestic flights departing Gladstone Airport are booked no earlier the 4.45pm. Please note, Aldesta Hotels does not accept responsibility for flight delays or flight schedule changes. Guests departing from Gladstone Airport can book a transfer from the marina (bus or taxi) when they make their reservation or at the hotel reception. The bus transfer service will depart the Gladstone Marina at 4:00 pm (dependent on the boat arrival being on time) and will be available on Wednesday, Friday and Sunday. Please note: Should the Heron Islander be unavailable on any particular day, we reserve the right to operate the transfer on an alternate vessel. As transfers are weather and marine conditions dependent, we strongly recommend that you purchase travel insurance for your holiday. The Heron Islander will not operate on Christmas Day, Wednesday 25 December 2019. It will instead operate on Thursday 26 December 2019. For further information or to book your boat transfers, please contact us on 1800 875 343 (within Australia), U.S. and Canada based number 1 855 251 8261, outside Australia +61 1800 875 343 or email [email protected]. 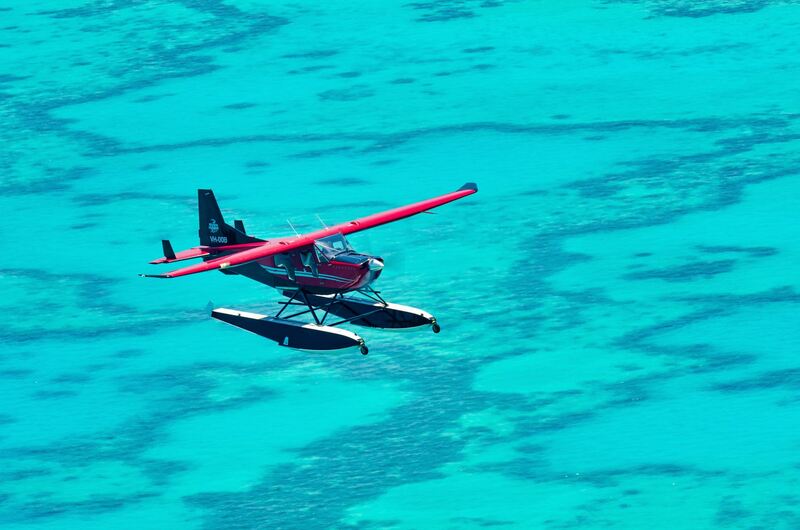 Begin your holiday by catching a scenic seaplane flight between Gladstone and Heron Island and experience a unique perspective of the Great Barrier Reef. 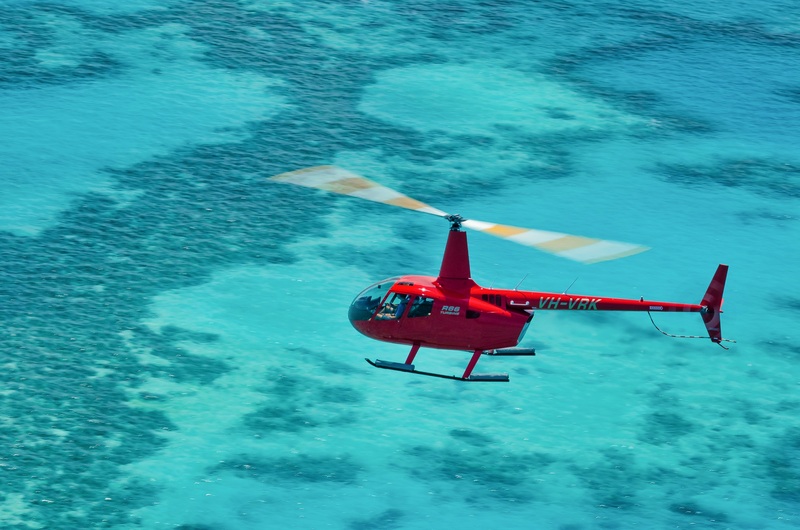 Watch tropical islands from above, spot whales, sharks or turtles lurking below and view amazing turquoise reef formations before landing on beautiful Heron Island – all in just 25 minutes. 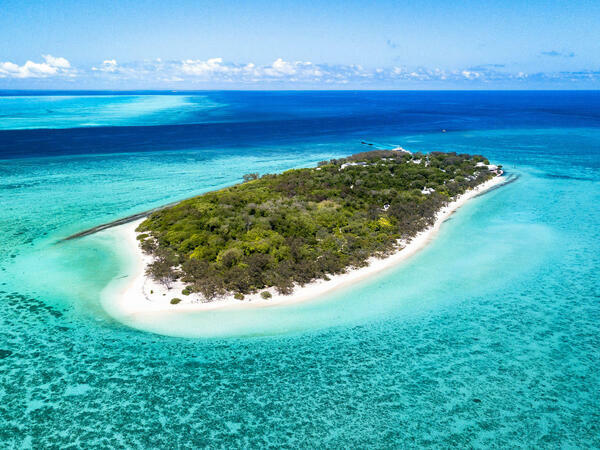 Land on the crystal clear waters of the Great Barrier Reef and walk the last meters through the tropical shallow water (up to knee height) to the shore of Heron Island. Australia by Seaplane, operates the scenic transfers daily (except Christmas, Boxing, and New Year’s Days) subject to availability and tides times. Arriving into Gladstone, please make your way to the Australia by Seaplane Office, close to the main Gladstone Airport Terminal. After collecting your luggage at the baggage carousel, please exit the main Airport Terminal and turn right, and you will find the Australia by Seaplane Office 100 metres from the Gladstone Airport (look for the cream building with the ‘Australia by Seaplane’ sign). Please allow 75 minutes prior to arrival and departure to allow for check-in procedures. A minimum of 2 or 4 passengers per flight are required to operate, dependent on aircraft availability, please inquire for further information. Click for a map to the Australia by Seaplane office. Please note: Seaplanes do not operate on Christmas Day, December 26th, or New Year’s Day. Seaplane reservations cancelled 48 to 24 hrs prior to date of departure will incur a 25% cancellation fee per passenger, per flight, and cancellations within 24 hrs, a 50% cancellation fee per passenger. As transfers are weather and marine conditions dependent, we strongly recommend that you purchase travel insurance for your holiday. For further information or to book your seaplane transfers, please contact us on 1800 875 343 (within Australia), U.S. and Canada based number 1 855 251 8261, outside Australia +61 1800 875 343 or email [email protected]. Marine Helicopter Charter operates scenic helicopter transfers daily, subject to weather constraints. You’ll enjoy expert commentary by their experienced pilots, as your flight from Gladstone passes Facing Is. and Curtis Is., and then about 40 km of the Coral Sea before reaching Polmaise Reef, where you may see turtles, rays, and sharks. You’ll pass Masthead Is., Erskine Is. and the wonder that is Wistari Reef, before arriving at Heron Island. Marine Helicopter Charter’s service desk and passenger lounge is located next to the baggage carousel in the Gladstone Airport arrivals area. Light snacks and free Wi-Fi are available. Please allow 60 minutes prior to departure for check-in procedures. Please Note: There is a maximum baggage allowance of 15 kg per person. Smaller, soft-sided bags are strongly recommended, as they’re more easily accommodated in the helicopter’s restricted cargo hold. There are no exceptions to this rule as it is mandated by the Australian civil aviation authority. 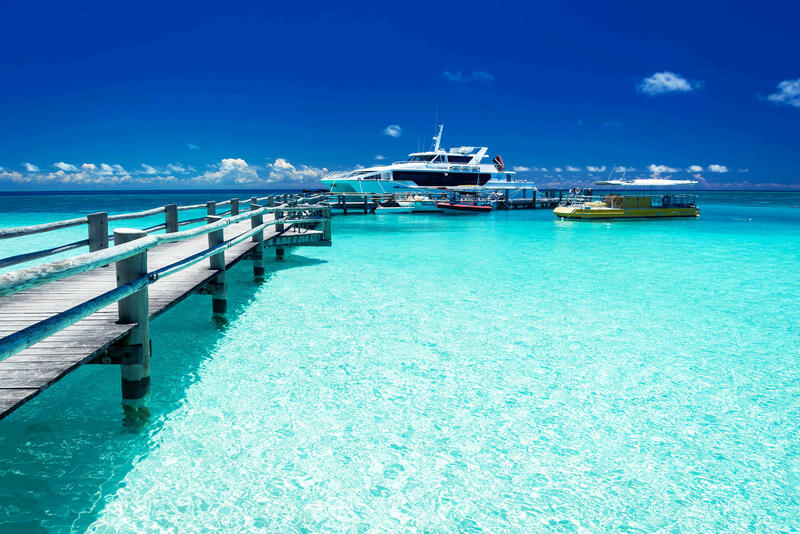 Extra and excess baggage can be either: 1) transferred to Heron Island aboard the Heron Islander from the Gladstone Marina, to arrive later in the day, or 2) Marine Helicopter Charter can provide complementary, secure storage at the airport. Keep in mind, any baggage returning on the Heron Islander is subject to its sailing schedule, and must be programmed accordingly to ensure its arrival for your outgoing flight from Gladstone. Please note: Helicopter reservations cancelled within 48 hrs prior to date of departure will incur a $50 cancellation fee per passenger, per flight. No cancellation fee applies if the reservation is rescheduled for a later date. As transfers are weather and marine conditions dependent, we strongly recommend that you purchase travel insurance for your holiday. For further information or to book your helicopter transfers, please contact us on 1800 875 343 (within Australia), U.S. and Canada based number 1 855 251 8261, outside Australia +61 1800 875 343 or email [email protected].